Axolotls are aquatic salamanders with extraordinary regenerative abilities. The adorable and enigmatic axolotl is capable of regenerating many different body parts, including limbs, organs, and even portions of its brain. Scientists hope that a deeper understanding of these extraordinary abilities could help make this kind of tissue regeneration possible for humans. 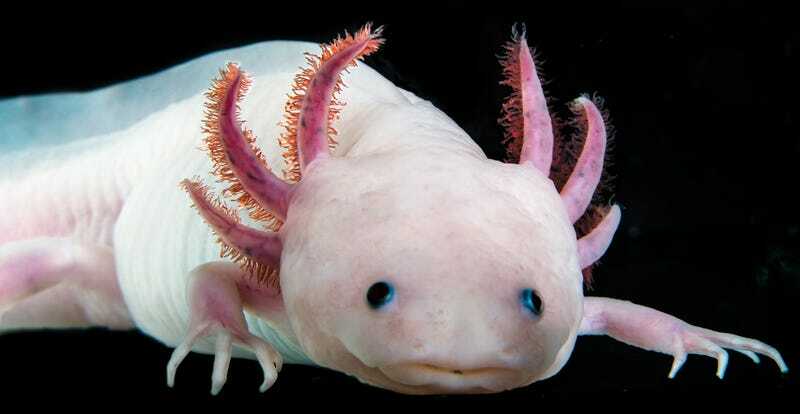 With news today of the first complete axolotl genome, researchers can now finally get down to the business of unraveling these mysteries. Genome sequencing and assembly are iterative processes, according to Randal Voss, the co-lead author of the new study and a professor in the University of Kentucky’s Spinal Cord and Brain Injury Research Center. Last year, his team reached a point where they had a manageable number of pieces to work with, around 125,000 large chunks of DNA, but they still had to organize these pieces into 14 extremely long linear DNA puzzles. Nature is amazing, and it’s already solved a lot of problems for us. We just have to figure out the nuts-n-bolts of it all. Ultimately, tissue regeneration in humans might not work exactly like it does in salamanders, but if we can harness it in a broad way, it will be a paradigm shift for medicine.